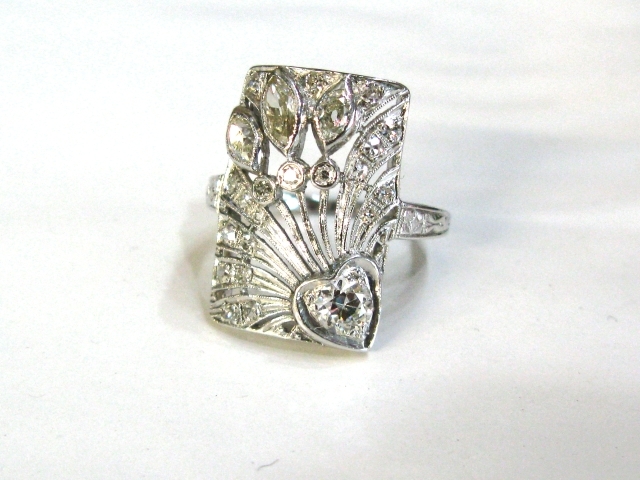 A beautiful vintage platinum ring with 1 old European cut diamond, set within a heart shaped frame, est. 0.34ct (clarity:SI1 & H colour); 3 marquise European cut diamonds, est. 0.51ct. (clarity:VS & K-L colour) and 20 single cut diamonds, est. 0.30ct (clarity:VS-SI & H-I colour).